Dice potatoes and boil in a large saucepan of salted water until fork tender. Heat the half & half, butter and garlic in a saucepan over medium heat until simmering. Remove from heat and set aside. 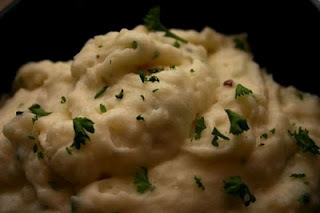 Drain the potatoes and mash with the garlic-cream-butter mixture. Add the Asiago cheese and White Truffle infused olive oil and stir to combine. Let stand for 5 minutes so that mixture thickens. Garnish with parsley if desired.